The city of the dukes, the « gatekeepers to the Alps » as the expression went, was the historic capital of the States of Savoy before Turin was deemed more suitable. A past that still today stands out in the city, in its architecture, its institutions and its very identity. Chambéry, an Alpine city ? An urban area or a mountain area ? Are the two irreconcilable ? With its strong historical position, the city is primed to play a key role in an Alpine network of rapidly changing urban centres. In short, it lies at the crossroads of a new relation between cities and mountains. 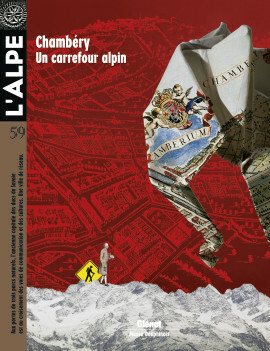 Chambéry in 2013 will celebrate mountains in a number of events involving participants from every economic sector. Those events will bring together mountain and urban inhabitants via forms of solidarity that Bernadette Laclais, MP and mayor of Chambéry, hopes to see grow. The mission of the Maison des Parcs, located in the centre of Chambéry, is to create closer links between mountain and urban inhabitants. How should the separate identities of the Bauges, Chartreuse and Vanoise ranges be presented ? How can their occasionally divergent expectations be met ? And what is the targeted public ? A vast debate lying at the heart of the complex relations between the city and its mountains. Insightful political ambitions made Chambéry a hub in the European rail network. The precocious willingness to embrace progress left its mark. A human mark with the presence of the railway culture and an architectural mark with the majestic rotunda. Today, the Lyon-Turin rail project has confirmed the very special situation in which the city finds itself and has breathed new life into multimodal links that were first imagined… in the 1830s. A love story, with its ups and downs, but a very active relation in step with the European Union. With the ebb and flow of events over the centuries, the relations between the inhabitants of Chambéry and the Italian populations over the mountains have undergone many changes. The Museum of fine arts in Chambéry was fully renovated from 2009 to 2011 and now offers a new setting for its collections that owe a great deal to the Italian side of the Savoy. Art critic Jean-Louis Roux proposes here a very personal visit of a museum that enchanted him. The relation between Rousseau and Chambéry has always been impassioned. It was here, in a very rural setting, that the young Jean-Jacques grew to adulthood and the city is proud of that. But it was also here that the statue of the reviled revolutionary was thrown down. Today, the estate at Charmettes cultivates his memory and draws visitors from around the world. The general Benoît de Boigne, an eminent member of the high society of Chambéry, cut quite a figure. A soldier and trader in India, he then devoted his fortune to embellishing his native city. Today, the great benefactor looks over Chambéry from the top of the Elephant fountain, an unusual monument raised in his memory. In the 1800s, the Savoy and Chambéry were standard waypoints on any journey to the Alps and to Italy. In 1835, Alexandre Martin devoted a chapter to the « habits, character and customs » of the city in his book La Suisse pittoresque et ses environs. A guide intended for tourists that blithely mixed clichés, notes on the population and virtually ethnological observations. Gilles Garofolin has walked the streets of the city for many years, for both his work and his pleasure. Of the hundreds of thousands of images in his archives, he selected his best of Chambéry. Wherein lies the charm of Chambéry, appreciated by both inhabitants and travellers ? It is due, in part no doubt, to its natural setting of lakes and mountains, but also the narrow streets of the old town where the pedestrian zones invite passers-by to sit for a moment at a terrace café. Cuisine in Chambéry can call on tasty local dishes from the surrounding mountains. But it has also learned, sometimes to an industrial degree, to draw on the rich contributions of travellers who halted in the region located at a crossroads of culinary influences.